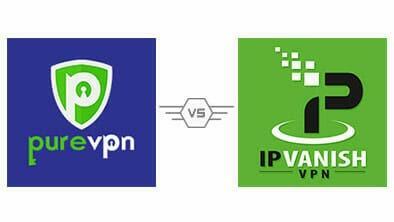 PureVPN and IPVanish are two well-known VPN providers, offering keen performance and high reliability. But which is best, and what are the differences between each one? It’s a tight competition between the two, so here’s everything you need to know about a couple of strong contenders, and which one we think makes it to the top spot! Both IPVanish and PureVPN are premium VPN providers, with a host of experience when it comes to online security and streaming. They’re heavyweights when it comes to speed and reliability, so our tech experts tested both brands to come up with a comprehensive comparison of the pros and cons of each one. Which one wins the battle royale? It’s IPVanish vs PureVPN – let’s check it out! While IPVanish has better speeds if that’s what you’re interested in, they’re pretty even in most other respects. Both scored well in terms of latency, with PureVPN having a slight edge as they have more server locations to choose from. This includes niche locations such as Guatemala and Jamaica, as well as coverage in China. Each offers users unlimited bandwidth, with superfast servers that can be used for P2P activities or streaming. However, you’ll only be able to use P2P on selected servers with PureVPN. We had no issues with either provider during testing, and no drops in connection. You can log in with five simultaneous devices while using either VPN, with no lag to speak of while using their US and UK servers. As they’re reasonably close in terms of overall performance, we checked out their features in-depth to help separate the two. Available Streaming Services: The most important question for most users is whether you’ll be able to access Netflix. Sadly, neither can commit to unblocking the popular streaming service, but they can both be used to unblock Hulu and Amazon Prime streams. PureVPN can also access BBC streams, which is one feature that IPVanish can’t match. Mobile Apps: Both providers have native iOS and Android apps, although you won’t be able to use PureVPN with a Windows phone. It’s not a problem for the majority of users, but native app support is a must if you plan to use the VPN on mobile. Protocols: PureVPN uses OpenVPN, L2TP, PPTP and SSTP for a comprehensive range of protocols. IPVanish doesn’t allow for SSTP, so it’s a win for PureVPN. IP Addresses: PureVPN has over 80,000 IP addresses, while IPVanish has 40,000 to choose from. There’s a clear winner, although 40,000 is nothing to be sniffed at. Speeds and Bandwidth: You’ll be free to use either VPN for as long as you want since both offer unlimited bandwidth, coupled with great speeds. IPVanish did take a little longer to connect initially, coming in at 14 seconds compared to the 10 of PureVPN. Even so, it’s worth the wait considering it’s faster overall, which is the most important aspect for the majority of users. Payment Methods: Often overlooked, each VPN has a range of payment methods, including anonymous options if you want to stay incognito. Both PureVPN and IPVanish have AES 256-bit encryption to keep your data secure. Each also offers kill switch functionality, so you’ll never have to worry about the VPN connection dropping during use, especially if using public Wi-Fi. PureVPN does allows for VPN over Tor natively through their apps, giving them the edge once again if you want more options for privacy while you are online. VPN customer service is generally hit or miss, depending on a range of factors including the size of the company and where they’re based. PureVPN has live chat support as well as email, while IPVanish reps will only respond via email as they have no chat functionality on their website. Response times are quicker with PureVPN, as they operate 24/7. You’ll have to wait until the office opens with IPVanish, and a follow-up email will take at least a few hours to arrive in your inbox. On the other hand, live chat support isn’t always helpful, and some of the messages we received from the PureVPN team were obviously generic cut-and-paste replies. The 24-month deal offered by PureVPN is obviously tempting at $2.45 per month, but it is a long-term contract. They’re priced comparatively if you’re looking for something more flexible, so it’s really down to personal preference. We’d argue that IPVanish’s $0.05 difference is probably worth it for the speeds alone, unless you’re a Windows phone user who plans to use your VPN over the Tor network. For everyone else, IPVanish is probably the best value for money. When it comes to PureVPN vs IPVanish, it’s clear that they’re similar in terms of the overall user experience, and the quality of their service. Both work to keep you safe while you’re online, but we have managed to select a winner. The extra servers, additional protocols, and improved customer service you’ll find with PureVPN make it a worthy contender, but IPVanish earn a hard-fought victory thanks to their faster speeds and reliability. With over 15 years of experience they’re a tried and trusted provider, and you can’t go wrong with their VPN. To be honest, I am not a fan of either of these VPNs. What would be an additional option? Thanks for the question! It’s definitely true that not every VPN is ideal for every user. A different VPN really depends on what you’re looking for. A provider like ExpressVPN is a great all-around choice, but if you’re looking for speed over privacy or vice versa, different options such as ExpressVPN or HideMyAss could be ideal. If you’re interested in learning more about VPNs, or comparing existing services, visit our other VPN comparisons and reviews to understand which one suits your browsing needs best!